Airports are almost always the most expensive place to rent a car. The rental car facility at Phoenix Sky Harbor International Airport is no different – you pay a premium for the convenience of picking up your car at the airport. If you want a cheap car rental in Phoenix, you need to book an off-airport rental car. For a cheap rental car, avoid the Phoenix airport! It’s so easy to arrange to pick up a rental car at the airport that few of us think twice about doing it. However, in Phoenix you pay a high premium for what can be a limited amount of convenience. A quick search for a three-day car rental in November 2017 showed the cheapest car rental in Phoenix was $58 for an economy car rented at one of Enterprise’s off-airport locations. That compares to $143 (also for an economy car) rented through Sixt and picked up at the Sky Harbor airport car rental facility. 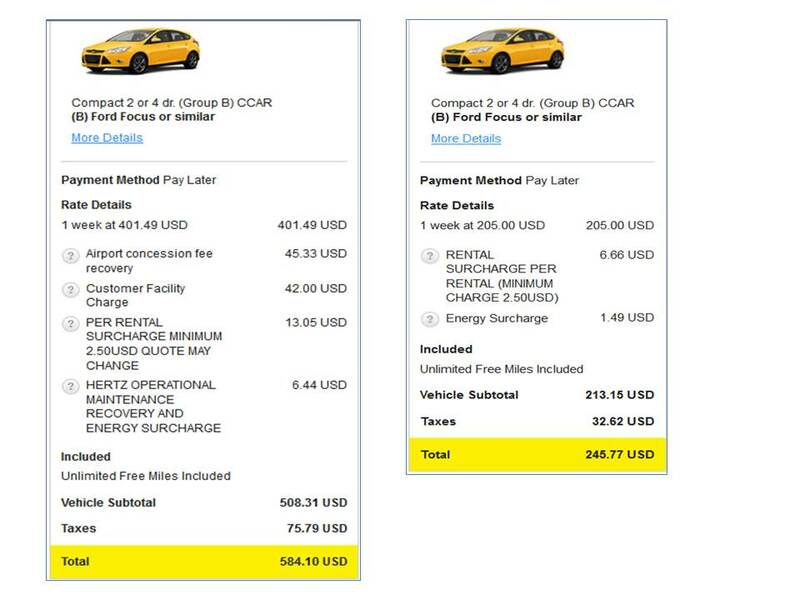 The dramatic price difference between an airport car rental and an off-airport rental isn’t a fluke. The cost of doing business at the airport adds up to higher bills no matter which rental company you choose. I’ve generally found that the base rate for a rental car is a lot higher at the airport rental car facility than other locations in Phoenix. Like two or three times higher. I’m assuming the difference in base rate is due to the higher cost of operating at the airport. Or maybe it’s just higher because the rental agencies know they can get away with it. Whatever the reason, lowering the base rate by getting a cheap off-airport rental also lowers all of the other fees and taxes that are applied to the base rate. This can lead to substantial savings in a high tax city like Phoenix. Phoenix has to pay for airport improvements and that fancy $260 million car rental facility, so the government either requires car rental agencies to add special fees directly to your bill, or they charge the rental companies and let them pass it along to you, or a little of both. The airport concession fee and airport surcharge that show up as itemized expenses on rental car bills sound like mandatory fees. And sometimes they are. But sometimes they are just fees that the rental car companies add to the bill themselves. And sometimes they are a mix of the two. As far as I can tell, cars rented through Phoenix Sky Harbor’s rental car facility are subject to an 11% airport concession fee and a $4.50 per day airport surcharge. These are mandatory for all airport rentals. (There is also some sort of state energy charge that seems to be mandatory for all rentals in the state, not just airport rentals). Anything beyond that is probably a charge the rental company has added to cover their own costs. In any case, those extra airport fees add up. But in Phoenix you can avoid them by booking your car at an off-airport location. While you’ll pay taxes on any car rental, you’ll pay more in Phoenix if you rent your car at the airport. Along with all the usual transportation and sales taxes you might expect, Maricopa County and the city of Phoenix impose significant local taxes on rental cars to fund sports facilities. Like many other places, it’s easier to force out-of-town visitors to pay for facilities that local voters don’t want to pay for. In Phoenix, the goal is to tax rental cars and hotels to the tune of $1.2 billion over 30 years to pay for tourism promotion, the Cardinals stadium, Cactus League stadiums, and additional youth sports facilities. Since state law actually forbids imposing taxes not related to transportation on rental vehicles, the rental car companies sued a few years ago and the tax was declared unconstitutional. The court ordered that the money be refunded, but that hasn’t happened and the tax is still being collected. In a high-tax city like Phoenix, applying those extra taxes to the higher base rate of an airport car rental leads to substantially higher costs. When planning our 2014 winter trip to Phoenix we looked at the cost of renting a car at Sky Harbor airport. It was pretty expensive, so we decided to see if we could save money (without adding too much extra hassle) by renting a car in town instead. 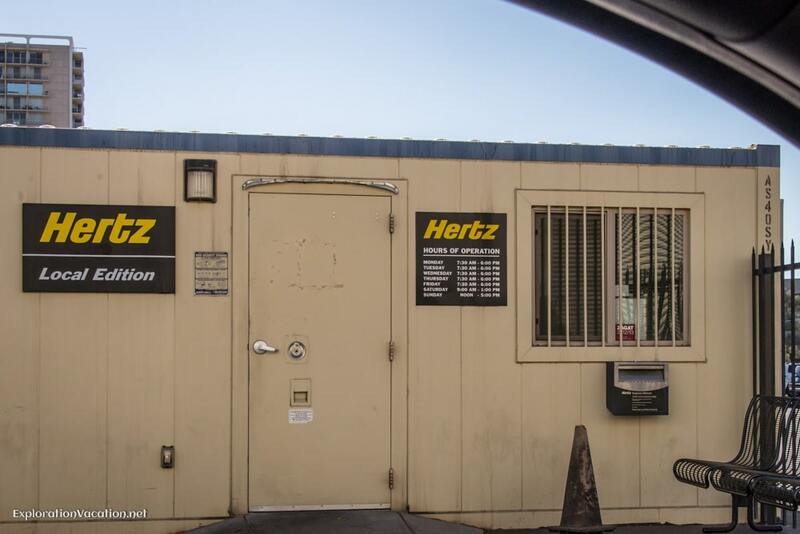 We happened to be looking at Hertz and noticed that they had a rental office not far from our lodging in north-central Phoenix. It appeared the rental office was along the light rail line, but I couldn’t figure out if I could easily get from the airport Sky Train to the light rail and then to the rental office (I now know you can), so we included the cost of a taxi between the airport and the car rental office in our calculations. The amount we could save by renting the exact same vehicle downtown (instead of at the airport) was substantial (several hundred dollars for a week’s rental), so we booked it. It worked beautifully too, thanks to a cab driver who knew where the very basic (and nearly hidden) Hertz office was located. We returned the car to the same location, walking back a block or two to take the train to the airport. It was almost as easy as renting from the airport, but cut our costs by about half. Our experiment with an off-airport rental worked so well in 2014 that we tried it again in 2015. Yes, you are seeing that correctly: $584 if we picked up the car at the Sky Harbor car rental facility, but only $246 if we grabbed a cab ($20-30) or took the train ($2) downtown to pick it up. The base rate for the off-airport rental was about half of the airport rental rate. Since the base rate for the car was significantly lower, the taxes were also lower. However, even if the base rate were the same, renting a car in downtown Phoenix eliminated almost $90 in airport-related fees – along with the extra taxes that would be levied on that $90. Obviously the cost difference between an airport rental and an off-airport rental will vary between companies, destinations, and times of year. However, in places with high airport fees and/or high taxes, you can find a cheap rental car simply by leaving the airport. Some of those extra fees on airport rental cars are to pay for Sky Harbor’s $260 million state-of-the art car rental facility just down the road from the airport. Note that I said just down the road from the airport. While these rental car facilities are becoming increasingly popular around the country as a way to manage airport space and traffic, they do not improve the travel experience. And they significantly increase the cost of an “airport” car rental. I am often willing to pay a premium for the convenience of walking from the baggage claim directly to my rental car. However, if I have to get on a shuttle to get my rental car, I’m going to go wherever the cheapest rental cars are located. And that is definitely not at the airport! Sometimes it makes sense to pay more – even a lot more – for your car rental. However, many people will find it is equally convenient to leave the airport to take advantage of a cheap car rental deal. Book a cheap off-airport rental car if . . . While cost isn’t the only consideration when renting a car, an off-airport car rental will work well for many people. If one of the following describes you, you should book a cheap off-airport car rental. While this may come as a surprise to many, not every visitor to Phoenix needs a car. Downtown Phoenix is very walkable. If your business will keep you downtown, you probably won’t need a car at all. In addition, the metro system through downtown Phoenix is very good, cheap, and easy to use. 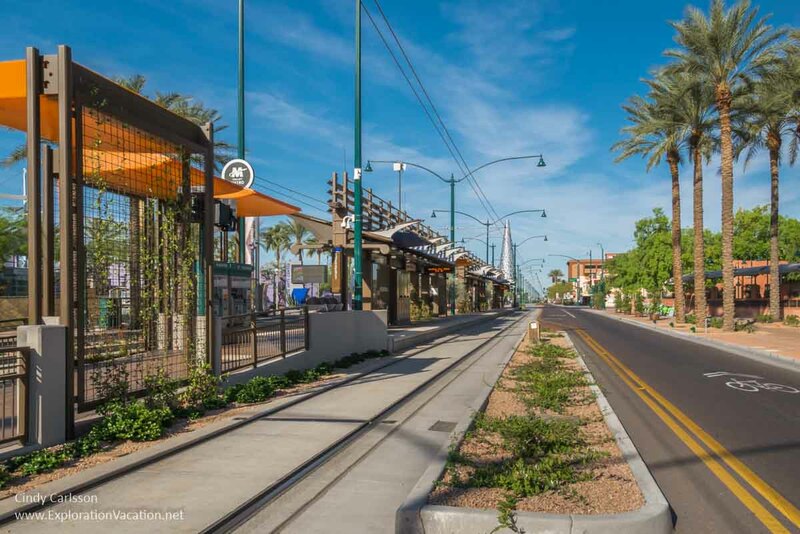 Light rail trains running on surface streets can get you to many places in Phoenix, Tempe, and even parts of Mesa. If you are starting your trip downtown, but plan to travel farther afield after a few days, pick up your car at one of the downtown rental agencies or have it delivered to your hotel when you actually need it. It makes no sense to pay for a car that is just sitting in the hotel parking lot and you’ll save additional money by picking it up somewhere other than the airport. A number of rental car agencies actually have offices in hotels. Examples include the Hyatt Regency downtown Phoenix (Enterprise), the DoubleTree Paradise Valley Resort (Avis), Marriott Desert Ridge (Hertz), and Scottsdale Embassy Suites (Dollar). Others are located in shopping areas near hotels. If you are staying in or near one of these locations, this is an ideal place to get your rental car. Just take the hotel shuttle to your lodging and walk over to pick up your car when you need it. In addition, many rental car agencies will pick you up (often for free) or deliver your car to your hotel (usually for a fee). That means you can stay almost anywhere and have a rental car available when you need it. Like visitors staying in downtown, this is a particularly good option if you only need a car for part of your visit. Use the hotel shuttle and get your car when you actually need it. Even if the rental location nearest you isn’t the cheapest in the city, it will still be a lot cheaper than renting your car at the airport. If you are arriving in Phoenix between 8 am and 5 pm, you should have no trouble picking up an off-airport car rental. The Phoenix airport is well-served by cabs and light rail, making it easy to get to most off-airport car rental offices. However, make sure you check the hours of the specific office where you plan to rent your car. While some of the off-airport rental car offices keep longer hours, many are open only from 8 am to 5 pm. And some – particularly hotel locations – maintain even more limited hours. While many people traveling to Phoenix can benefit from a cheap off-airport car rental, there are reasons to pay the extra cost to use Phoenix Sky Harbor’s rental car facility. No matter when you need your car, you can get it. As noted, many of the off-airport rental offices keep pretty standard business hours, making an early morning or late night pick-up impossible. Weekends can be a problem too. If you are traveling very early or very late and aren’t spending the night in the Phoenix area, you will probably need to rent your car at the airport. You don’t have to find a cab or manage the transit system to get to Sky Harbor’s rental car facility. If you are traveling with a lot of baggage, the simplicity offered by the Sky Harbor rental car facility may be worth the extra cost. No matter who you prefer to rent from, they probably have cars available at the airport. While several major car rental companies have off-airport locations or offer hotel pick-up, not all do. If you participate in a loyalty program that provides significant benefits and your preferred company doesn’t have an off-airport location in Phoenix, it may be worth the extra cost of an airport rental to access your benefits. A number – but not all – of the major car rental companies have off-airport locations. Those that maintain more than one off-airport locations in the Phoenix area include Enterprise, Hertz, and Avis. If your goal is simply to find a cheap rental car, use big search engines like Kayak, Expedia, etc. Often these will automatically bring up off-airport rental locations because that is where the cheapest cars are. However, some online search engines and most rental car company sites default to the airport. (After all, the more you pay, the more they make on the sale.) 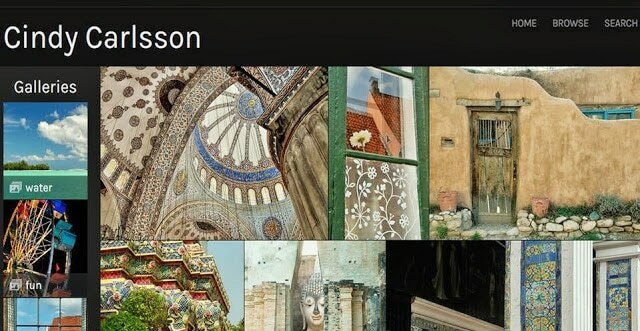 No matter what site you are using, make sure your search is set for all locations in Phoenix. If the site you are using won’t let you do that, try another one. Be careful using rental car company sites to search unless you are willing to pay more. Many of these default to the airport location even if they have other offices. And, of course, if you are searching for a car with a company that only rents cars from Sky Harbor’s car rental facility, then those are the only prices you will see. Again, most off-airport car rental offices are only open during business hours – and some hotel locations are open even fewer hours. Make sure you know the rental office will be open when you arrive. If you aren’t picking up a car at your hotel, you’ll need to think about how you will get to your car. Taxi service is easy and goes anywhere. However, the light rail system is super cheap and works well for some rental locations. Taxis are always available curbside at the ground transportation area of each terminal at Phoenix Sky Harbor airport. A taxi into the city will likely cost 20 -$30, depending on traffic. A ride up to northern Scottsdale or out to Mesa can cost considerably more. However, Enterprise has a rental office that is only a few minutes from the airport, making it a very inexpensive cab ride. There are a number of online cab fare estimators that can give you an idea of what a typical fare would be. Phoenix has a light rail system that connects the airport to downtown Phoenix, Tempe, and Mesa. The system is fast and cheap ($2 for a single ride, $4 for an all-day pass). Rather confusingly, the section of light rail serving the airport is called the Sky Train. It is free, but it only runs from the airport to the 44th Street Station. Once there you need to get off, buy a transit ticket, and board the regular Valley Metro light rail. It’s easy, but it sounds a little complicated until you actually do it. Although I expect this will change over time, there are absolutely no services available at the 44th Street Station. Nor is there a cab stand. This is just a place to change trains.